The championship starts this Sunday, May 24. The first game of the day (1:15) features The Boston Shamrocks and Tir na nOg in the Orla Benson Cup Final, and at 2:30 the hurlers of Tipperary and Wexford contest the Kieran Sheehan Cup Final. Christopher's and Armagh-Notre Dame open the senior football championship at 3:45 and Kerry and the Wolfe Tones play at 5:00. Unfortunately I cannot post reports for the next 2 weeks. However, I will be back on track 2 weeks from now. McAnespies picked up the first silverware on offer this year by winning the Pat O'Brien Cup with a rousing second half performance. Trailing by five points at half time, McAnespies outscored Galway by 10 points to one in the second half to run out 4-point winners. Neil Donaghy is back in action for McAnespies in 2009. It was an open, entertaining game despite the soft conditions in Canton. Galway surprised some with a first half performance that more than matched the current Boston and North American champions. Finian Everard’s first half efforts yielded a goal and 2 points for Galway, however, Galway’s forward line could have made even more of the chances created. Galway dominated in the first two thirds of the field, and moved the ball well, but converting let the Westerners down. McAnespies kept in touch with frees and points from play thanks in large part to the industry of Colm McCrory. At the half Galway led by a score of 2-7 to 0-8. McAnespies awakened in the second half. Midfielders Gary Clarke and Neil Donaghy lifted their game to help turn the tide. Returning to McAnespies this year, Moy clubman Donaghy, who was part of McAnespies’ 2007 team, could be an important asset in the defence of the championship. Eugene McKenna moved out from his corner back position, and after McAnespies got within a point, the Clones man leveled the scores. Three magnificent points followed from Colm Donnelly, Neil Donaghy, and Keith Hudson. McCrory capped an impressive display of scoring by McAnespies with a pointed free. Galway got some great performances from Paul Cummins, Conor Sobelowski, and Finian Everard, but McAnespies superior finishing proved to be the difference in the end. Galway: Brian Calvey, Paul Cummins, Dave Molloy, JJ O’Neill, Peter Ryan, Sean Gallagher, Tom Walsh, Conor Sobelowski, Edmund Spruhan, Finian Everard, Peter Nolan, Jamie Kehoe, Donal Redmond. Macs: D. Wright, Steven McGill, Eugene McKenna, Eugene Daly, Alan Nestor, Keith Hudson, Gary Clarke, Neil Donaghy, Jamie Kelly, Colm McCrory, Colm Donnelly, Peadar Nugent, Steven McGettigan. This week I brought my 2 boys to gaelic football practice. I’ve played Gaelic games for 30 odd years or more, and now, with 3 kids I would like for them to get the same enjoyment from gaelic football and hurling that I have. I was delighted to hear that a youth Gaelic Athletic Club is being formed in the area. I brought the boys down for their first gaelic football practice of their lives. Nessan (6) and Keenan (4) had lots of fun and I was delighted to see them learning the skills of the game. Coached by Nobby Walsh and Chris O’Connor, the gathering of a small group of kids is the start of what will hopefully be a growing and flourishing club. (Drop me an email to find out more - upthegaa@gmail.com). Kerry v Dublin. Declan Walsh (4) and Keenan O'Donnell (4) learn the art of the kick pass while wearing the colours of their parents counties. Galway and Aiden McAnespies will contest the Pat O'Brien Cup Final next Sunday, May 17 at 3:00. Galway defeated western rivals, Mayo, while a strong McAnespies side defeated the Connemara Gaels 1-20 to 3-4. Tipperary had a good win over cup holders Fr. Tom's and will face current Boston champions Wexford in the Kieran Sheehan Cup final. 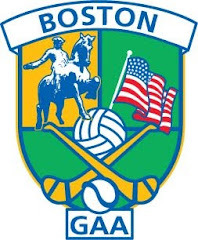 The Boston Shamrocks will defend the Orla Benson cup title against challengers Tir na nOg. Both games take place on Sunday, May 24 at 1:15 and 2:30. Senior Football Championship play also begins Sunday week, May 24. At 3:45 Christopher's play Armagh-Notre Dame, and at 5:00 Kerry will open their season versus The Wolfe Tones. The Cup schedule carries on next week, Sunday May 10, with the semi-finals. There will be a new name on the Pat O'Brien Cup as holders Donegal were knocked out the first hurdle this year. The footballers of Mayo and Galway meet at 2:00 in a battle of The West, while the Boston and North American champion McAnespies meet the Connemara Gaels at 4:00. In hurling, Tipperary and holders Tom's meet at 3:00 in the Kieran Sheehan Cup semi final, while at 1:00 the Orla Benson Cup holders, the Boston Shamrocks meet fierce rivals Roscommon as the ladies begin to it their stride. Incidentally, the last team to win a cup and the Boston championship in the same year were Aiden McAnespies in 2007. Last year Donegal won the Pat O'Brien Cup and were beaten in the championship final, Tom's won the Sheehan Cup and had a poor hurling championship, and the Shamrocks won the Orla Benson Cup and did not figure in the Ladies football final. Some argue that the cups are a distraction from focusing on the championship, others see them as an opportunity to get more competitive games in early in the year. Few will argue that getting into a winning habit is not a good thing. Last week's winners in the Pat O'Brien Cup were Aiden McAnespies, The Shannon Blues, and Galway. The Connemara Gaels and Mayo are also still in contention. Unfortunately I am laid up with a shoulder injury and cannot drive, and typing with my left hand alone proves to be a challenge. I'm afraid that I will be unable to report in any meaningful way on the games for the next 4 weeks or so. I will commence posting match reports on the site beginning in June - le cunamh De.